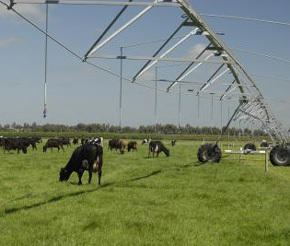 New Zealand dairy farmers are using center Pivots to enhance pasture grazing opportunities all 12 months of the year. The grass is definitely greener for New Zealand dairy farmers. Many are using center pivot irrigation to further enhance one of that country’s most precious agricultural resources: pasture. According to the country’s agricultural ministry, New Zealand’s success in dairy production relies predominantly on highly productive, rotationally grazed pasture and herds of high genetic merit. The warm climate and productive pastures enable herds to graze in pasture year-round, thus avoiding the need for indoor housing and expensive feed supplements. The country’s dairy industry, which began in 1814 with the importation of two cows and a bull, is today one of New Zealand’s most dynamic agricultural assets. Exports from what is termed “pastoral agriculture” accounted for nearly half of all goods exported from New Zealand. The dairy industry (the largest industry within the pastoral sector) accounted for nearly half of those exports. New Zealand dairy products far exceed what the country’s 4.3 million residents can consume. But the export market is strong, taking 90-95% of dairy production and selling it on the world export market as cheese, butter, milk powder, and other dairy solids. Dairy farmers, always looking for more efficient milk production practices, are turning to mechanized irrigation to manage more cows per hectare of pasture, keeping those grasses more productive throughout the year. Pasture grazing is New Zealand’s greatest agricultural asset and an inexpensive way to get nutrients into the animals. Sheep farming is still viable, but dairy cow numbers have increased dramatically, while sheep numbers have dropped. Their average yearly rainfall is 635-762 mm, enough to ensure pasture growth for much of year, but center pivot irrigation linked to rotational grazing allows them to intensively graze pasture grasses all year long… even during their winter months (june, july and august). Dairy farmers like to allow 48 hours after irrigating before grazing a particular section. That lets the plant dry out and increases the sugar content. There is very little supplementary feeding. They monitor consumption of the grasses and any other dry matter being fed. Dairy herds need to produce large quantities of milk to be succesful, but quality is also important since pricing is also dependent on milk solid content. Farmers don’t want colored water, they want milk with good protein content; to do that they must keep the dry matter and energy content high in the pasture. Water application rates are low, often around 6 mm, because the sandy loam soils have high infiltration rate and good drainage. Center pivots are low pressure machines (30-35 PSI at the pivot) with drops that place sprinkler heads close to the crop. They know pasture water consumption rates (pastures are usually a mixture of ryegrass and white clover) and the soil handling capacity, so they only apply water the plant can use. Then, if it does rain, they don’t risk saturating the soils. Center Pivots are sectioned into different wedges. Fenders constructed from plastic coated metal tubing extending on both sides of each tower to direct electric fencing beneath the tires. This allows the pivot to move from one grazing area to another easily and without labor in the field… a pasture management concept used succesfully in Brazil for several years to produce grass-fed beef cattle under Pivots. Dairy farmers aren’t the only ones using mechanized irrigation. Both linears and Pivots are being used succesfully in the production of vegetable crops like peas, carrots, potatoes and cabbage, as well as cereal crops. Center Pivots are programmed to make a complete circle every 48 hours applying 6 mm of water. Mild weather year-round and relatively low evapotranspiration rates make longer machines a suitable choice in many situations. For the New Zealand dairy farmer, raising grass is by far the best feed option.